Earlier this month Nvidia released its latest and greatest graphics card, the GeForce GTX 580 1.5GB. Based on a tweaked version of Nvidia's now infamous Fermi architecture, the card stormed through our new graphics benchmark suite, staking a strong claim to the title of the most desirable graphics card on the planet. As ever though, our mind wandered to what figures we could get out of the card if we pushed it past the speeds that Nvidia officially rated it at. Cue a quick download of MSI Afterburner. This is a small but capable graphics card overclocking tool that we’ve found to be reliable and, probably more importantly, doesn’t look like it was designed by a 12 year-old with a peculiar fixation on military history. 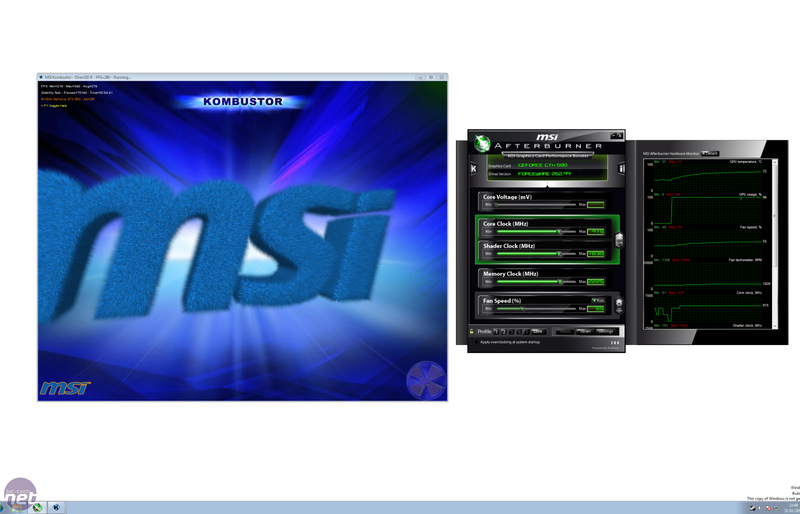 As a bonus, MSI bundles its Kombustor stress test tool with the Afterburner download; it’s essentially just an MSI-branded version of FurMark. With the two programs downloaded and installed, we set about overclocking the card from its stock GPU core and memory speeds of 772MHz and 1GHz (4GHz effective) respectively. It’s important to note at this point that we couldn’t adjust the GPU core voltage of our Nvidia reference test card, as this is a feature that has to be added by board partners. This could limit our overclock a little, as extra voltage can help to stabilise very high overclocks. The GeForce GTX 580 1.5GB is a mighty card, but we still wanted more MOAR!! We’ve seen some pre-overclocked GTX 580 1.5GB cards out there with an 825MHz GPU core speed, so that seemed like a pretty good place to start. We hit this figure with ease, so pushed on in jumps of 10-15MHz, testing the stability of the overclock each time with Kombustor until the board topped out at a mahoosive 915MHz GPU core frequency. This gave us a stream processor clock speed of 1,830MHz, as the stream processors always run at double the core speed in the GTX 580. This represents a 19 per cent overclock. We followed a similar methodology to raise the memory clock, successfully pushing the GDDR5 chips up to a speed of 1.11GHz (4.45GHz effective). However, we hit a few problems when we tried to then benchmark the card at these speed, as it froze up as soon as we started Just Cause 2. This illustrates why we test with actual games rather than declaring a benchmark stable as long as it’ll run FurMark or some other stress test. Running a demanding game such as Just Cause 2 is a much sterner test of an overclock as it’ll stress not only the stream processors of the GPU, but its DX11-specific and memory units, plus the driver and the graphics card's memory chips.